"I would kill for you: a study in maternal ferocity"
"This gift feels like it's been touched a lot"
"Sraid nam Marbh: The end of the road"
"What you are looking for is elsewhere"
‘WOW’ is a body of work that takes its title and inspiration from retail marketing techniques. Through this body of work I seek to question what products or objects are deserving of the ‘WOW’ label applied so liberally by retailers, and I try to make sense of my own life experience alongside the images and messages broadcast through marketing materials. 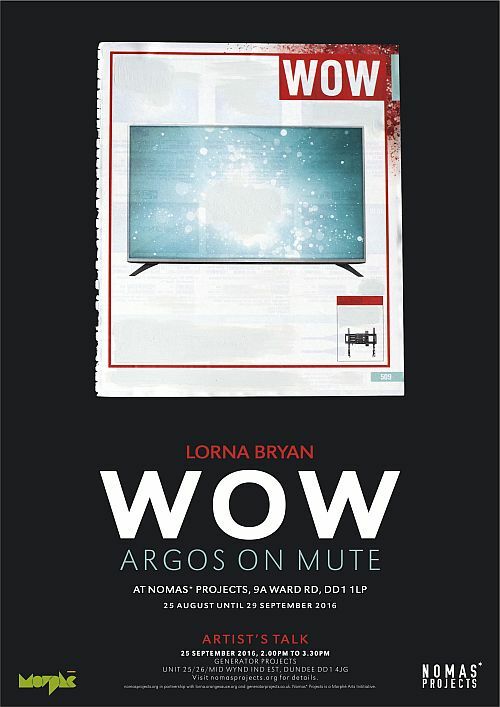 In ‘WOW: Argos on Mute’ the “unique selling points” of televisions printed in the Spring/Summer 2016 Argos catalogue have been obliterated. I am wowed and unsettled by the choice of over 100 different TVs that the catalogue presents. The removal of all product information has brought satisfaction and a new understanding of the situation. Lorna Bryan is an artist based in Newcastle upon Tyne, where she completed both her BA and MFA at Newcastle University and previously worked as a designer for a large retail chain. Her practice takes various forms but frequently adopts or references existing visual presentation methods to examine what value judgements have been made. Sunday 25 September 2016, 2.00pm – 3.30pm at Generator Projects, 25/26 Mid Wynd Industrial Estate, Dundee, DD1 4JG.